Triplen harmonics are the odd integral multiple of third harmonic wave. If the frequency of third harmonic wave is ω then frequency of triplen harmonic wave will be 3nω, where n = 3,5,9,…These waves posses a special characteristics and hence it becomes important for the study and analysis of power system. The amazing property of triplen harmonics is that they are in time phase in the three output phase of alternator. Why triplen harmonics are in phase? Let us consider a three phase alternator having identical phase windings i.e. R, Y and B in which harmonics are produced. Let the three phase emf are VR, VY and VB. These emf can be represented as below. VR = E1msin(ωt+Ø1) + E3msin(3ωt+Ø3) + E5msin(5ωt+Ø5) +……. VY = E1msin(ωt-2π/3+Ø1) + E3msin[3(ωt-2π/3)+Ø3] + E5msin[5(ωt-2π/3)+Ø5] +……. VB = E1msin(ωt-4π/3+Ø1) + E3msin[3(ωt-4π/3)+Ø3] + E5msin[5(ωt-4π/3)+Ø5] +……. Let us simplify each of these phase voltages. = E1msin(ωt-2π/3+Ø1) + E3msin[(3ωt-2π)+Ø3] + E5msin[(5ωt-10π/3)+Ø5] +……. = E1msin(ωt-2π/3+Ø1) + E3msin(3ωt+Ø3) + E5msin(5ωt-4π/3+Ø5) +……. = E1msin(ωt-4π/3+Ø1) + E3msin[(3ωt-4π)+Ø3] + E5msin[(5ωt-20π/3)+Ø5] +……. = E1msin(ωt-4π/3+Ø1) + E3msin(3ωt+Ø3) + E5msin(5ωt-2π/3+Ø5) +……. Also, the third harmonic component in each of the VR, VY and VB are same in i.e. E3msin(3ωt+Ø3). Thus we can say that, all triplen harmonics in the three phases are in time phase. 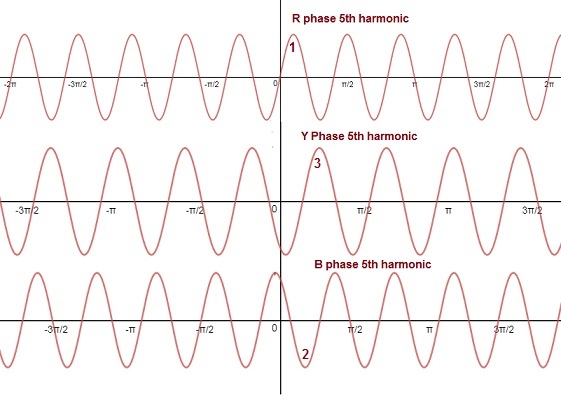 The fifth harmonic components in emf wave are below. By comparison of 5th harmonic components with fundamental, we can say that phase sequence of 5th harmonic are opposite to the fundamental. This mean the phase sequence will be R, B and Y for fifth harmonics. Hence, they have negative phase sequence. The waveform is shown below. It is clear from the above waveform that first R phase gets maximum followed by B and Y phase. Therefore their phase sequence is R, B and Y. All triplen harmonics i.e. 3rd, 9th, 15th etc. are in phase. The 7th, 13th, 19th etc. have positive phase rotation of R, Y and B. The 5th, 11th, 17th etc. have negative phase sequence of R, B and Y.